A cosy hotel in the centre of Rovaniemi. Open during winter season. Here you can have a good night’s sleep, relax in the sauna and enjoy the atmosphere in the local pub. It’s easily accessible and all city services are close by. Our hotel, located in the centre of Rovaniemi, is a charming and inviting place to rest. Our cosy rooms and extensive room selection cater for all needs. The rooms have comfortable beds and all you need for a good night’s sleep. Some rooms also have their own sauna. It’s nice to spend time in the spacious and inviting lobby, and you also have a gym and a comfortable relaxation suite with sauna at your disposal. Do what the locals do and have a drink at the hotel’s legendary local pub Pisto. In our bright conference and event facilities, you can organise both meetings and events as well as private events. All areas of our hotel have free WiFi. It’s easy to arrive at and leave from the hotel, as it’s located in the centre of Rovaniemi with good transport connections. The airport shuttle bus stops in front of the hotel. Railway station and bus station are only a short walk away. There’s parking space for your car in the hotel garage and nearby outdoor parking areas. All city centre services are easily accessible. Ounasvaara’s nature routes are within a short distance of the city centre. You can also easily reach all the sights in the surrounding area from here, such as the Ranua Wildlife Park and Santa Claus Village. Scandic Polar will open for winter season on 1 December 2019. The hotel has a cosy gym and a relaxing sauna. If you prefer outdoor exercise, we can advise you on the best routes in the nearby area. With us you don't need to worry about parking. Our hotel has both outdoor parking and its own parking garage. 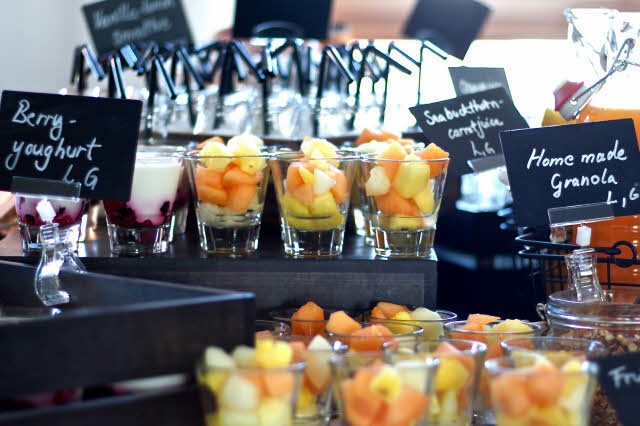 Enjoy delicious flavours at our breakfast buffet in our hotel restaurant. Also, stop by for a drink in our legendary pub. Organise meetings, conferences and events for up to 70 people in our conference and event facilities in the centre of Rovaniemi. The inviting Korkalo-Rakka meeting room with amazing views is also suitable for more informal occasions.